The Gaslight Baker Theatre is excited to present Lost in Yonkers as our 2019 Season opening production. 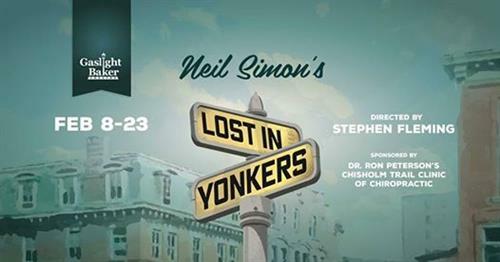 Written by America’s great playwright Neil Simon, this Tony and Pulitzer Prize-winning play is set in 1942. Bella is 35 years old, mentally challenged, and living at home with her mother, stern Grandma Kurnitz. As the play opens, Grandma’s ne’er-do-well son Eddie deposits his two young sons on the old lady’s doorstep so that he can go on the road as a salesman. The boys are left to contend with Grandma, with Bella and her secret romance and with Louie, her brother and a small-time hoodlum, in a strange new world called Yonkers. Over the course of the play, the young boys learn lessons about love, responsibility and the importance of family that will carry them into adulthood.